Identification: Quite variable. 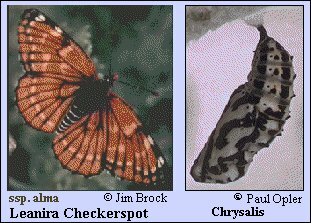 Upperside ranges from black to orange, with light spots. Underside of hindwing is cream-colored with black veins; wide black median band surrounds cream-colored spots. Life history: Males perch and sometimes patrol on hilltops for females. Eggs are laid in bunches on underside of lower leaves of host plant. Caterpillars feed on leaves and flowers; young ones live together in a loose web. Third-stage caterpillars hibernate. Caterpillar hosts: Paintbrush (Castilleja species). Habitat: Open prairies, canyons, desert hills, foothills, washes, roadcuts. Range: Local, in scattered populations. Western Oregon south to California, Nevada, Utah, and western Colorado; Baja California. Conservation: Colonies in California have probably declined due to invasion of exotic grasses and resultant increased fire frequency.